MULTI REVIVE plus PRENATAL was designed for women looking for a clean source of not only vitamins and minerals, but enzymes, trace elements, immune factors, antioxidants, phyto-nutrients and other factors to support hormone balance, build strong bones and promote women's health. With added Superior Herb and Organic SuperFood power, this Women's Formula is also a superb Prenatal supplement. 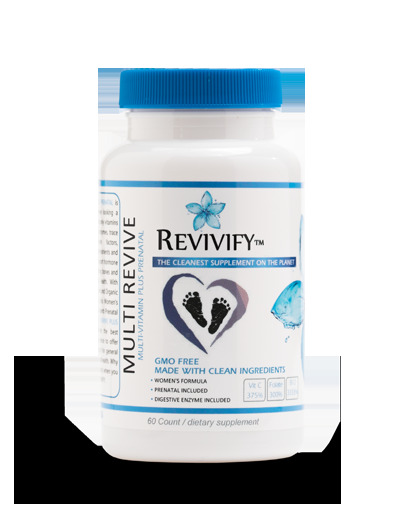 MULTI REVIVE plus PRENATAL combines the best ingredients and science to offer women one product for general nutrition and prenatal health. Why take multiple products when you can simplify and REVIVIFY. Our product contains many vitamin and mineral good for woman and baby during pregnancy such as: Vitamin A, C, D-3, E, K-1, B-1, B-2, B-3, B-6, B-12, calcium, iron, iodide, Magnesium, Zinc, copper..
Folic acid: are suggested for use in women of childbearing age in order to prevent neural tube defects, reduce the risk of birth defects in the infant, and decrease the risk of preterm delivery, infant low birth weight and fetal growth retardation. Biotin: plays a key role in the body. It supports the health of the Biotin plays a key role in the body. 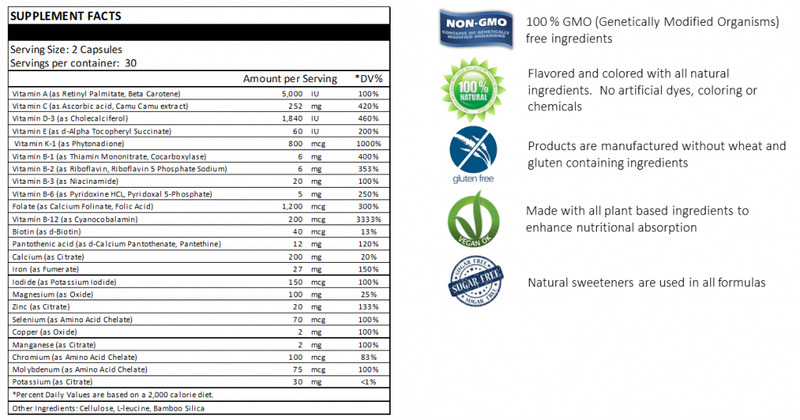 It supports the health of the skin, nerves, digestive tract, metabolism, and cells. It contain the B complex vitamins are needed for healthy skin, hair, therefore it is often recommended for strengthening hair and nails before and after pregnancy.